In my last OpenDaylight tutorial, I demonstrated how to implement an OSGi module for OpenDaylight. In this tutorial, I will show how to use these modules for reactive flow programming and packet forwarding. To make things concrete, we consider a simple scenario in this tutorial: load balancing of a TCP service (e.g., a web service using HTTP over TCP). The basic idea is that TCP connections to a service addressed through a public IP address and port number are distributed among two physical server instances using IP address re-writing performed by an OpenFlow switch. Whenever a client opens a TCP connection to the service, one of the server instances is chosen randomly, and a forwarding rule is installed by the network controller on the ingress switch to forward all incoming packets of this TCP connection to the chosen server instance. In order to make sure that the server instance accepts the packets of the TCP connection, the destination IP address is re-written to the IP address of the chosen server instance, and the destination MAC address is set to the MAC address of the server instance. In the reverse direction from server to client, the switch re-writes the source IP address of the server to the public IP address of the service. Therefore, to the client it looks like the response is coming from the public IP address. Thus, load balancing is transparent to the client. To keep things simple, I do not consider the routing of packets. 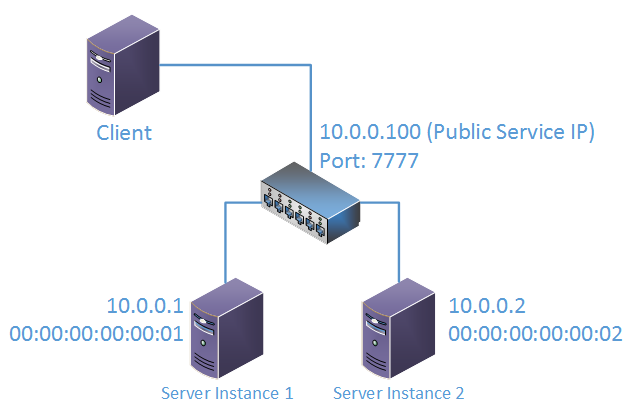 Rather, I assume that the clients and the two server instances are connected to the same switch on different ports (see figure below). Moreover, I also simplify MAC address resolution by setting a static ARP table entry at the client host for the public IP address. Since there is no physical server assigned to the public IP address, we just set a fake MAC address (in a real setup, the gateway of the data center would receive the client request, so we would not need an extra MAC address assigned to the public IP address). I assume that you have read the previous tutorial, so I skip some explanations on how to set up an OpenDaylight Maven project, subscribe to services, and further OSGi module basics. Data Packet Service for decoding incoming packets and encoding and sending outgoing packets. Flow Programmer Service for setting flow table entries on the switch. Switch Manager Service to determine the outport of packets forwarded to the server instances. // Define exported and used services for PacketHandler component. // Export IListenDataPacket interface to receive packet-in events. Moreover, we register for packet-in events in the Activator class. To this end, we must declate that we implement the IListenDataPacket interface (line 11). This interface basically consists of one callback method receiveDataPacket(...) for receiving packet-in events as described next. // Use DataPacketService to decode the packet. // Select one of the two servers round robin. // Synchronize in case there are two incoming requests at the same time. // Use FlowProgrammerService to program flow. // We did not process the packet -> let someone else do the job. Our load balancer reacts as follows to packet-in events. First, it uses the Data Packet Service to decode the incoming packet using method decodeDataPacket(inPkt). We are only interested in packets addressed to the public IP address and port number of our load-balanced service. Therefore, we have to check the destination IP address and port number of the received packet. To this end, we iteratively decode the packet layer by layer. First, we check whether we received an Ethernet frame, and get the payload of the frame, which should be an IP packet for a TCP connection. If the payload of the frame is indeed an IPv4 packet, we typecast it to the corresponding IPv4 packet class and use the methods getSourceAddress(...) and getDestinationAddress(...) to retrieve the IP addresses of the client (source) and service (destination). Then, we go up one layer and check for a TCP payload to retrieve the port information in a similar way. After we have retrieved the IP address and port information from the packet, we check whether it is targeted at our load-balanced service (line 28). If it is not addressed at our service, we ignore the packet and let another handler process it (if any) by returning packetResult.IGNORED as a result of the packet handler. If the packet is addressed at our service, we choose one of the two physical service instances in a round-robin fashion (line 38–52). The idea is to send the first request to server 1, second request to server 2, third to server 1 again, etc. Note that we might have multiple packet handlers for different packets executed in parallel (at least, we should not rely on a sequential execution as long as we do not know how OpenDaylight handles requests). Therefore, we synchronize this part of the packet handler, to make sure that only one thread is in this code section at a time. To forward a packet to the selected server instance, we select its IP address and MAC address as target addresses for each packet of this TCP connection from the client. To this end, we use IP address and MAC address re-writing to re-write the IP destination address and MAC destination address of each incoming packet of this connection to the selected server address. Note that a TCP connection is identified by the 4-tuple [source IP, source MAC, destination IP, destination MAC]. Therefore, we use this information as match criteria for the flow that performs address re-writing and packet forwarding. A flow table entry consists of a match rule and list of actions. As said, the match rule should identify packets of a certain TCP connection. To this end, we create a new Match object, and set the required fields as shown in line 58–64. Since we are matching on a TCP/IPv4 datagram, we must make sure to identify this packet type by setting the ethertype (0x0800 meaning IPv4) and protocol id (6 meaning TCP). Moreover, we set the source and destination IP address and port information of the client and service that identifies the individual TCP connection. Afterwards, we define the actions to be applied to a matched packet of the TCP connection. We set an action for re-writing the IP destination address to the IP address of the selected server instance, as well as the destination MAC address (line 70 and 73). Moreover, we define an output action to forward packets over the switch port of the server instance. In line 43 and line 49, we use the Switch Manager Service to retrieve the corresponding connector of the switch by its name. Note that these names are not simply the port numbers but s1-eth1 and s1-eth1 in my setup using Mininet. If you want to find out the name of a port, you can use the web GUI of the OpenDaylight controller (http://controllerhost:8080/) and inspect the port names of the switch. Finally, we create the flow with match criteria and actions, and program the switch using the Flow Programmer service in line 82. In the reverse direction from server to client, we also install a flow that re-writes the source IP address and MAC address of outgoing packets to the address information of the public service (line 90–112). However, we are not done yet. Although now every new packet of the connection will be forwarded to the right server instance, we also have to forward the received initial packet (TCP SYN request) to the right server. To this end, we modify the destinaton address information of this packet as shown in line 116–119. Then, we use the Data Packet Service to forward the packet using method transmitDataPacket(...). Both of these services implement packet handlers, and for now we want to make sure that they do not interfere with our handler. Be sure to use the IP address of your OpenDaylight controller host. The option --mac assigns a MAC address according to the host number to each host (e.g., 00:00:00:00:00:01 for the first host). In our implementation, we use these addresses as hard-coded constants. Now, you should see the output “Hello” in the xterm of host 1. If you execute the same command again, the output will appear in the xterm of host 2. This shows that requests (TCP connections) are correctly distributed among the two servers. Basically, you can now implement your service using reactive flow programming. However, some further services might be helpful. For instance, according to the paradigm of logically centralized control, it might be interesting to query the global topology of the network, locations of hosts, etc. This, I plan to cover in future tutorials. The tutorial is licensed under the Attribution-ShareAlike 4.0 International License (CC BY-SA 4.0).